San Diego, CA — When the original Mercedes-Benz CLS-Class debuted in 2004, it represented a bold statement for the German manufacturer…and it was made in a somewhat non-Germanic tone. The fast and flowing design of the sedan conveyed a distinctly feminine mystique and gave rise to a new category of car for the 21st century—the four-door coupe. Fast forward some seven years: The second-generation CLS debuts and the sedan that signalled a changing direction in car design had changed itself. Gone were the feminine aspects of the CLS, replaced instead by a taller front grille, more muscular haunches and a far more menacing look overall. Now, while the exterior look is what is most in-your-face about the second-generation CLS, what’s shoehorned under the hood has the kick-in-the-pants part of the equation covered. When this Teutonic brawler arrives in Canada later this year, it will appear in two forms: the more mild-mannered CLS 550 4MATIC and the decidedly wilder CLS 63 AMG. As you may have gathered, the latter is the racier version of this sedan, honed to a very fine point by the mad scientists at Mercedes’ performance division. This is the version I had the pleasure of driving in southern California and, more precisely, along a scenic route nicknamed the Sunrise Highway. There are a number of AMG models to choose from and the CLS has not necessarily been among the more compelling choices in the past. Sure, it had the same mechanical underpinnings as its brethren, but it seemed to be more of a poseur and less of a performer. This, too, has changed; so much so, the CLS 63 AMG should now be considered one of the premier sport sedans in the world at any price. Here’s why: For a far-from-insane amount of money (expect roughly $109,000), you get a honking big V8 engine (displacing 5.5 litres, no less), the additional motivation that only twin turbochargers can provide, a 7-speed automatic transmission (accurately branded a “SPEEDSHIFT”) with five separate shift modes and a very effective air suspension system. 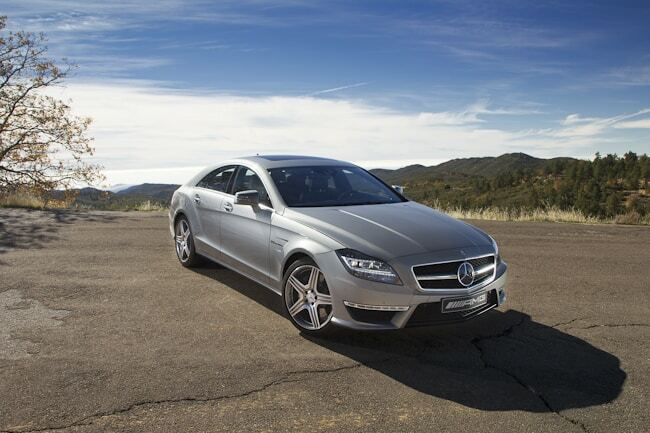 …the CLS 63 AMG should now be considered one of the premier sport sedans in the world at any price. The CLS 63 AMG comes in two forms: regular (with a “measly” 518 hp and 518 lb-ft of torque) and spicy (with 550 hp and 590 lb-ft), with the more picante version coming courtesy of the optional AMG performance package. Somewhat sadly, my white-knuckle experience along the Sunrise Highway was in the “more mundane” CLS 63, but in the final analysis this mattered little. Reason being, even this version is a mighty fast car with significant handling capabilities and a number of other very entertaining features. First off, let’s talk acceleration: While the CLS with the performance package can thunder from 0-100 km/h in just 4.3 seconds, the less highly strung model takes just one-tenth of a second more to complete the same task. Sure, the base 63 has a top speed limited to 250 km/h whereas the other AMG rockets on to 300 km/h…but unless you’re running from the law, you probably have little need for traveling at three times the speed limit in this country. While the CLS with the performance package can thunder from 0-100 km/h in just 4.3 seconds, the less highly strung model takes just one-tenth of a second more to complete the same task. Even more impressive than the car’s ability to travel in a straight line is its ability to veer from said line. The Sunrise Highway happens to be riddled with corners, including some of the high-speed variety, that propel you through a national forest and up a small mountain. The CLS is a big sedan, but despite this fact—and the fact that it was being driven well in excess of posted speed limits—it clung to the tarmac like a small sports car riding on tires made of molasses. Well, almost. The car’s sport suspension features three settings that operate on a sliding scale of performance: comfort, sport and sport plus. On the final setting, the most extreme, the CLS actually felt a bit rubbery over the tarmac’s undulating surface; the consensus was that the middle setting was the most confidence-inspiring of the bunch. In other news, the interior represents an inspired balance of the sporty and the luxurious. The stubby gear selector, also employed in the SLS supercar, saves space and looks hi-tech. The flat-bottomed sport steering wheel is just, well, flat-out cool. And the CLS also features the expected mix of wood, leather and metallic touches, combined with refreshing optional features such as massaging front seats. All in all, the 2012 Mercedes-Benz CLS 63 AMG is a wildly impressive car that will certainly appeal to the driver who appreciates an aggressive look and the performance to match.